Illustration for the article ‘If At First You Don’t Succeed’ by Judy Froshaug. A good example of the kind of issue led journalism that provided a challenge for the illustrator. The article about sub-fertility needed to be illustrated sensitively to reflect the wide range of emotions explored in the article. I wanted to create an image with a quiet mood. 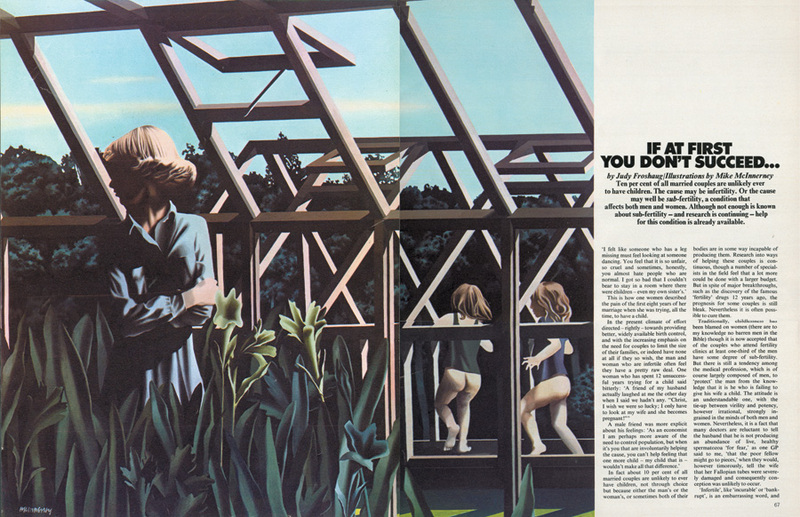 The greenhouse setting, implying nutured growth, the abundance of nature, the playing children, the woman hugging herself, visual props used to suggest a figure at the mercy of fate.